Here is a link to the video of the bee removal from an Austin home. I can’t even imagine having a hive in my ceiling. What a mess. 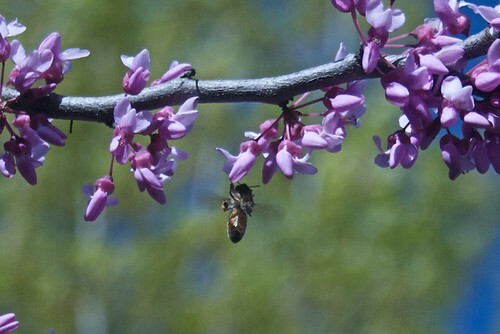 My wife captured this photo of a bee on our redbud in the back yard. 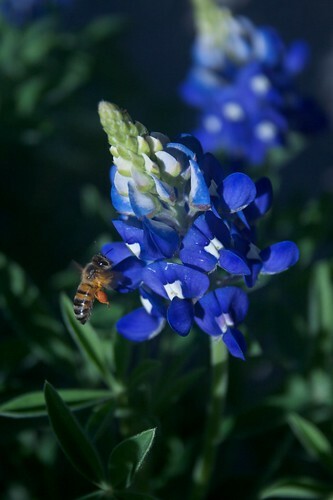 So much is blooming right now here in Austin that I’m a bit sad I don’t have my bees yet. Granted, it is just a few more weeks, but with the dogwoods, redbuds, buckeyes, and all the wildflowers starting to come up, I feel like I’m missing out on some perfect weeks that a new bee colony would enjoy. 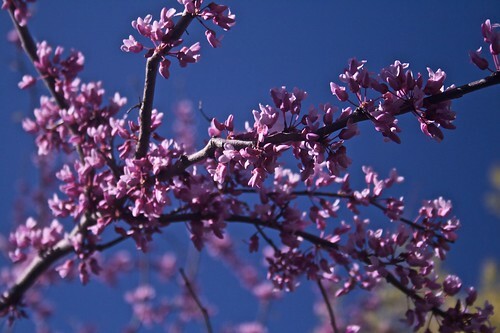 Here is a photo from my backyard of Texas Redbud in bloom. There are tons of YouTube videos on installing package bees, but I found this to be one of the better ones in terms of video quality and lack of crazy regional accents. My wife still makes fun of the clip from North Carolina where the phrase “just baaaang on it” is used throughout. Now that I’m done offending my southern friends, this video will give you a good overview of the steps taken to install bees. It seems every beekeeper has a different method, and while I won’t be using the steps outlined in this video exactly, it is close enough.